Ever since the M2 was released, BMW has been busy adding performance to it. 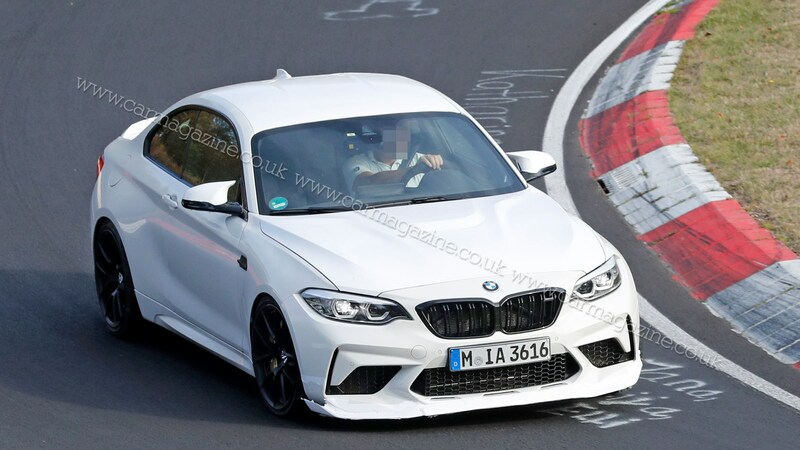 First there was the M2 Competition, then the M2 Competition with Performance parts – and now we’ve seen what looks like the M2 CS or CSL testing at the ‘Ring. As you’d expect, both the front and rear of the car looks more aggressive, and benefits from wider bumper at the front and spoiler at the rear. Elsewhere, both the brakes and wheels look to to be upgraded over the M2 Competition, and there’s a new engine hood, too. What you can’t see from the outside are weight-saving measures, but if it this is a CSL or CS you can expect weight to go down as power increases. Of course, this could be BMW testing a new range of M-performance parts – but the timing’s right for a new CS or CSL model. For everything else about the existing M2 Competition. 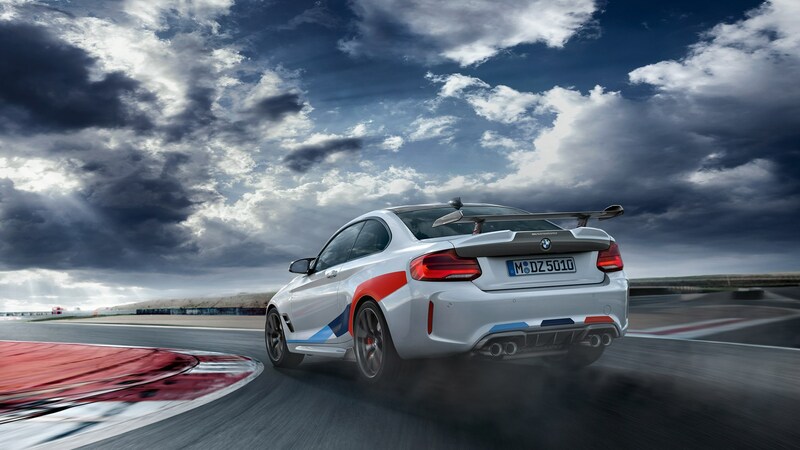 What’s on offer on the BMW M2 Competition with Performance bits, then? 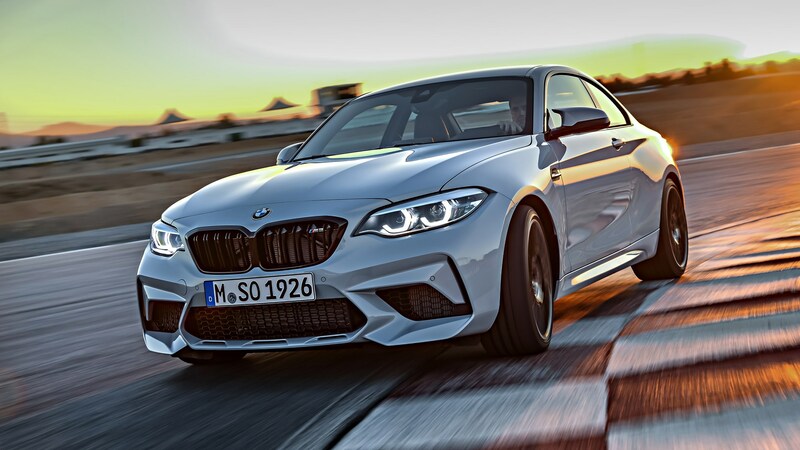 BMW’s M-Performance parts are available for the interior and exterior of the new M2 Competition, so there's the option to make your car look better - and drive better. 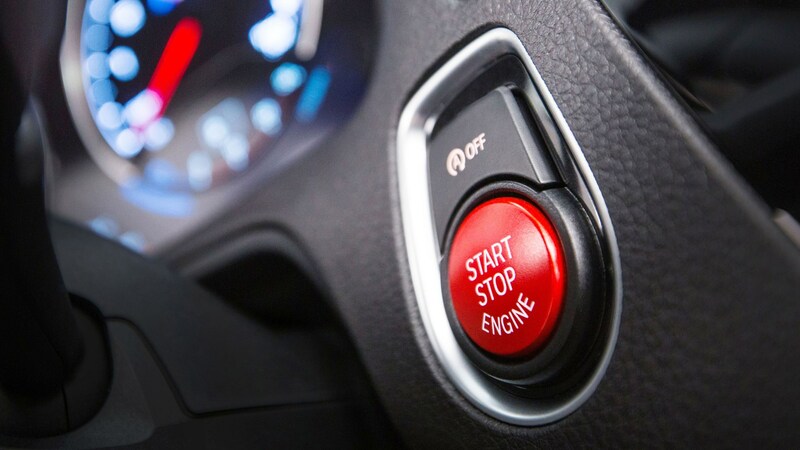 First let's talk about the bits that actually improve the handling and character of the car. First up, an M Performance suspension makeover allows you to lower the ride height by a further 20mm, and the damping tech has 12 compression settings along with a further 16 rebound settings. Yes, we're well into the realms of detailed nerd-out here. You can upgrade the M2’s brakes, too. Larger, six-piston BMW M Compound brake discs are featured in the new M Performance parts catalogue, and 19-inch M Performance forged wheels knock off 3.2kg a corner, compared to the Competition's standard 19-inch rims. All the (carbonfibre) trimmings, sir? More visually imposing is the weight-saving and aerodynamic kit the M Performance range also offers. For example, M2 Competition owners who feel their car is a little sluggish can get a carbonfibre bonnet saving 9kg, a carbon roof (5kg saving) and a carbonfibre tailgate (saving a further 6kg). 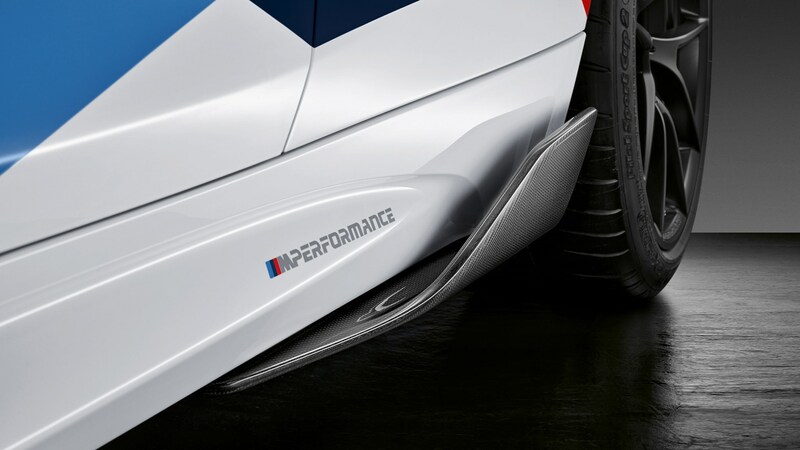 As well as saving weight, there’s also a whole suite of M Performance parts to stack downforce onto to the car. BMW will sell you everything from a new modified front splitter and kidney grille to side skirt extensions and rear spoiler – all finished in the black stuff, of course. 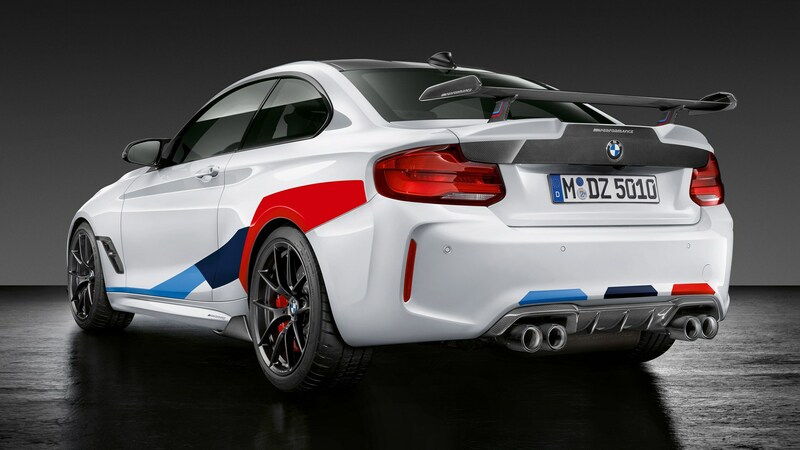 If you must, you can also get your M2 Competition adorned with the iconic M colours you seen in these pictures. 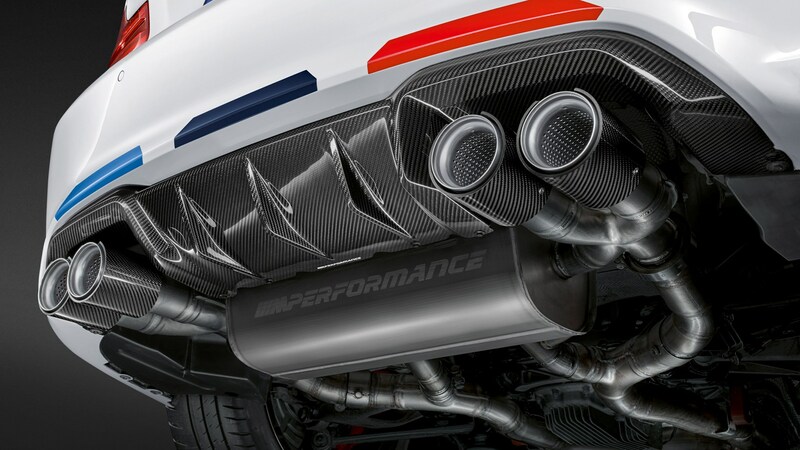 And one more thing, there’s a M Performance exhaust system with a titanium silencer that saves 8kg weight, but also ‘emphasises’ the sound of the M2 Competition. An unexpected side-effect no doubt. BMW hasn’t released prices for the M Performance parts yet, but we’ll update this article when we know more. 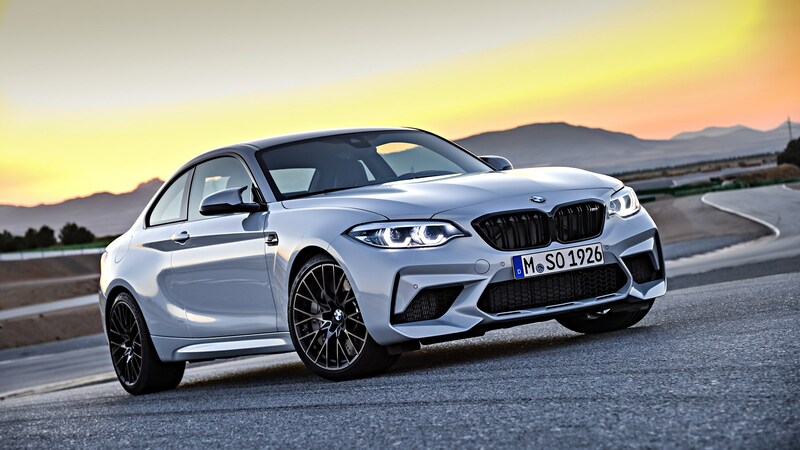 Featuring tweaked steering, braking and suspension components as well as redesigned exterior, the new M2 Competition makes gains over the original model across the board. And BMW says it also comes with a significant power boost. The M2 Competition will be available to order from mid-May 2018 and prices will start at £49,285 in the UK. It’ll also replace the original M2, so if you want the current one, it’s worth investigating now. 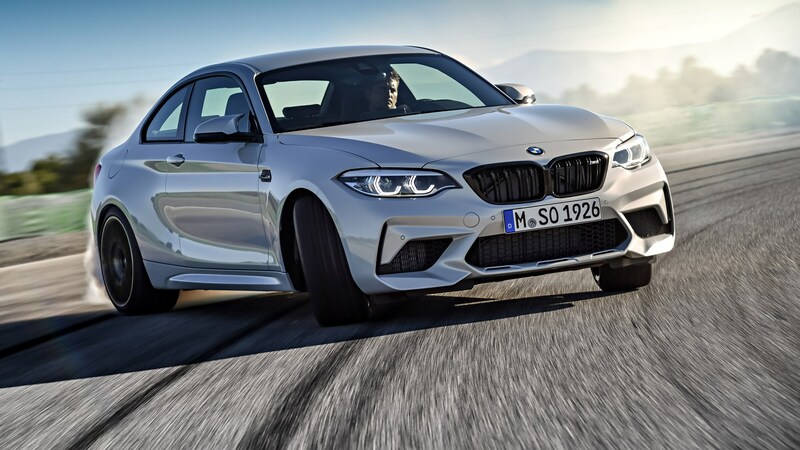 The new 2018 BMW M2 Competition: so what’s new? Let’s start with the engine. 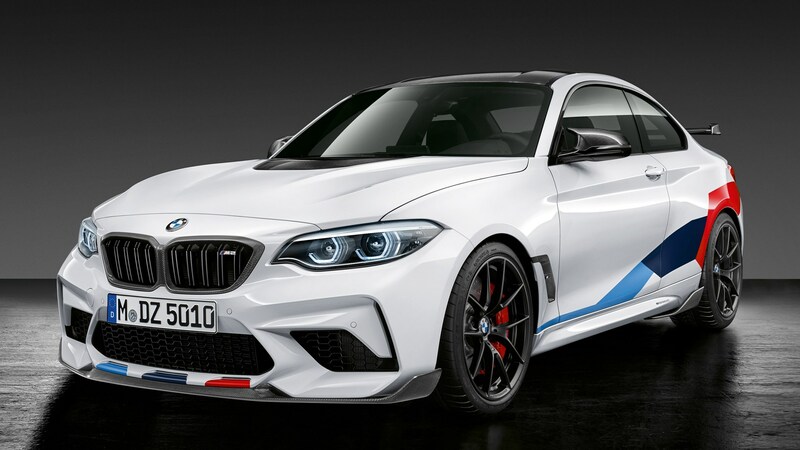 The new BMW M2 Competition packs a twin-turbocharged in-line six under its redesigned bonnet, offering 404bhp of push between 5250rpm and 7000rpm. You’ll get all 406lb ft of torque from the engine between a nice and broad 2350-5200rpm rev range. The result? The upgraded BMW with a DCT twin-clutch box will get to 62mph from a standing start in just 4.0 seconds (4.2sec in manual), and although top speed is pegged at 155mph, it can be unlocked to 170mph with the M Drivers' package. To deal with the extra cooling required, the new M2 Competition borrows tech from its larger M4 Competition sibling, and uses three radiators and a cooler to keep temperatures in check. A new exhaust system means the upgraded powerplant can breathe more easily, too. 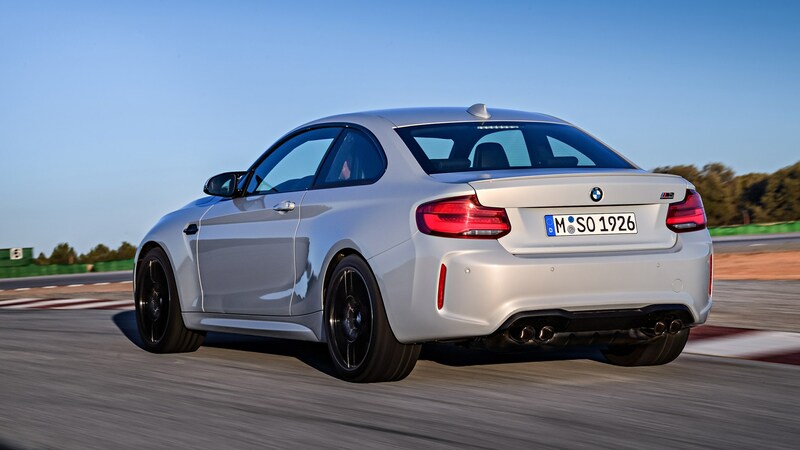 The new M2 comes with a dual-branch system with four tailpipes smothered in love-it-or-hate-it black chrome. The new cans also feature two driver controlled flaps – perfect if you want a proper M soundtrack. 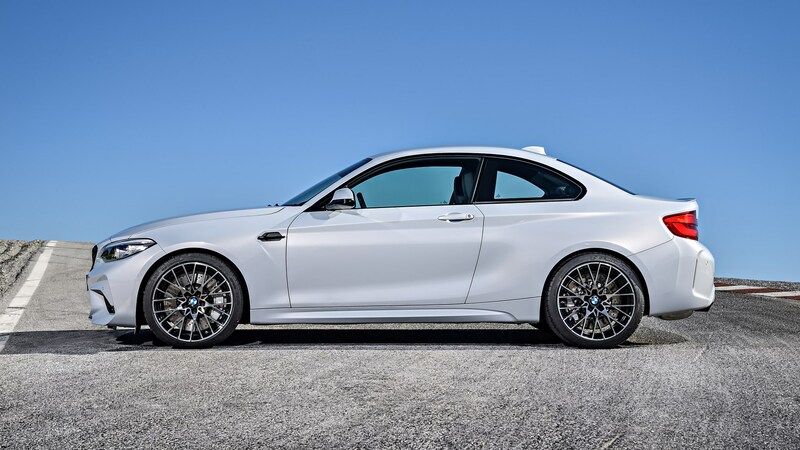 The M2 Competition comes with a six-speed manual as standard – complete with rev matching syncro function – but BMW says you can turn that off at the same time as the DSC. If you’d prefer paddles, a seven-speed M Double Clutch Transmission will also be offered. 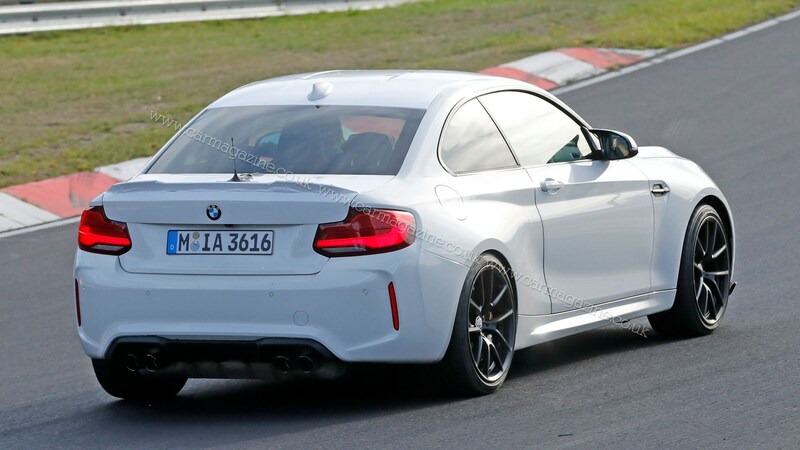 From a styling perspective, the M2 is little changed from the stubby, brutish 2-series shape of the existing M2. Uprated brakes, power steering designed to take into account the increased grip, and reconfigured electronics should all help that happen. What about the interior of the new BMW M2 Comp? The BMW M2 Competition looks meaner and more aggressive from the outside, and inside you can expect a range of Competition branding to set it apart from the original. At the same time, the new M2 will also be kitted out with driver assistance systems such as AEB, lane departure and collision warnings – so you’ll get a helping hand when you need it.